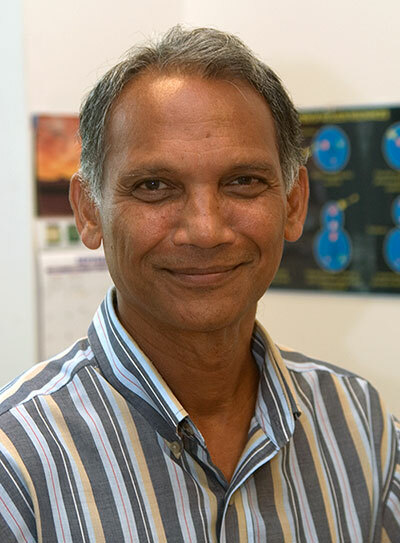 NEWPORT NEWS, VA – Dr. Hari Areti, has been selected to receive the Francis G. Slack Award, established by the Southeastern Section of the American Physical Society, to honor excellence in service to Physics in the Southeastern U.S. Areti, a senior scientist at Jefferson Lab and professor at Old Dominion’s Center for Accelerator Sciences, is being recognized not only for the advancement of accelerator science and physics in the region but for his efforts to engage and mentor students in the field. Since 2008, Areti has served as the head of Jefferson Lab’s Student Affairs office. In that capacity, he worked with undergraduate and graduate students at the lab and also administered the accelerator division’s graduate student program. He is passionate about undergraduate student research and regularly organized summer programs to encourage student interest in physics. He has also been active in working to increase the number of underrepresented minorities in accelerator science and to establish a faculty bridge position between Jefferson Lab and Morehouse College, an HBCU (historically black colleges and universities). Areti was also instrumental in establishing the Center for Accelerator Science at Old Dominion University, Norfolk, Va., which now has 10 faculty members teaching accelerator science and technology. The Francis Slack Award is presented each year by the Southeastern Section of the American Physical Society to honor Excellence in Service to Physics in the Southeast. The award is named for Francis G. Slack, a distinguished Vanderbilt University scientist who was a charter member of the Southeastern Section and who contributed significantly to its development. The award recognizes those who have worked to improve, expand or enhance physics programs in the region. The award was presented during the 84th annual meeting of the APS, Southeastern Section, November 16-18, 2017 at the Georgia College in Milledgeville, Ga.